The eighth generation Volkswagen Passat is in a league of its own, arguably up there with the best from premier German manufacturers Audi, BMW and Mercedes-Benz. The Volkswagen Passat is one of those cars which seems to have been around for ever. And in some ways that feeling is justified as the first Passat was launched some 41 years ago, since which 22 million have been sold. The new, eighth generation, however, is in a league of its own, arguably up there with the best from premier German manufacturers Audi, BMW and Mercedes-Benz. And perhaps not surprisingly it has a price tag to match many of their models. My estate model test car had a price of just under £30,000, but with the optional extras fitted to it that figure went up to £35,000. The new estate is lower than its predecessor and while being around the same length it’s some 85 kilograms lighter, helping to make the car both more frugal and sportier in terms of performance. Opt for an R-Line model and you get a Passat Estate which really looks the part thanks to stylish front, rear and side body kit. Inside there are R-Line decorative inserts in the dash and door panels as well as ‘Piano Black’ decorative inserts in the centre console. And as a £550 optional extra my test car was fitted with an R-Line sports pack, which gives you a suspension lowered by 15mm, an electronic differential lock and progressive steering which firms up at speed but becomes lighter when you are parking. Despite little alteration in length over the previous generation model, clever interior design work means the new car has far more space on the inside, with rear seat passengers now able to stretch their legs out in comfort. And when it comes to luggage space the new estate has a hefty 47 litres more than before, taking it to 650 litres. But in many ways it’s features which are not visible which make the new Passat such a premier car. Emergency Assist, for example, detects when the driver is not steering, braking or accelerating and assumes there is a problem, such as sleeping at the wheel or unconsciousness. It immediately goes into action to try to rouse him or her with audible warnings and then if that doesn’t work by using the brakes to make the car jerk several times. Meanwhile, the adaptive cruise control prevents the car colliding with vehicles ahead. If all that fails it carries out an emergency stop and switches on the hazard lights to warn other traffic. Then there is a new system to automatically brake the car if it thinks a pedestrian is about to step off the kerb and the driver is not reacting; a radar-style system which checks left and right as you back out of a supermarket-style parking space to make sure nothing is coming and lane assist to make sure you don’t inadvertently stray out of your lane. All very clever stuff. On the road the 2.0-litre R-Line model feels taught and sporty. The lowered suspension means it handles particularly well, going exactly where you point it with no body roll at all. The DSG gearbox is silky smooth although the 150bhp engine is not the quietest diesel around. It’s lively rather than fast but responds well to kick down on the accelerator and there is an option of driving it in Sport or using paddles behind the steering wheel for more responsive motoring. Extras I particularly liked on my test car included the powered tail gate and a new luggage system which features a raised, sliding floor panel which allows you to easily push heavy objects well into the boot area without risking a slipped disc. 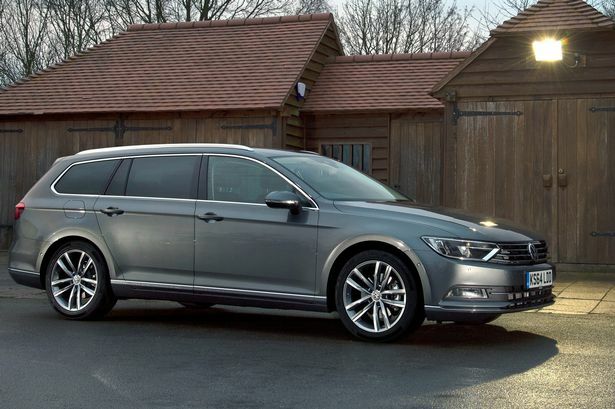 All in all the new Passat Estate is an extremely well thought out car which caters for all a motorist could ever want, and a lot more to boot. Mechanical: 1968cc, 150bhp, 4 cyl diesel engine driving front wheels via 6spd DSG automatic gearbox.